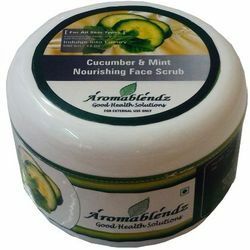 Providing you the best range of aromablendz apricot lemongrass face scrub, aromablendz cucumber & mint face scrub, aromablendz tulsi and turmeric skin glow scrub, aromablendz chocolate facial scrub, aromablendz orange & papaya moisturizing face scrub and aromablendz rice and oatmeal face scrub with effective & timely delivery. Use & Benefits: Lemongrass apricot scrub is a mild formulation that gently exfoliates the skin removing dead skin cells, grime and daily pollutants. 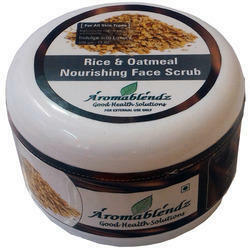 Enriched with soft abrasives and natural oils this mild face scrub will leave the skin clean and alive. Application:Apply in a circular motion with both hands avoiding eyes and other sensitive areas. Rinse off. Suitable for all skin types. Composition: Cream base, Lemongrass extracts, Hydroscopic polymers, walnut granules, Olive oil, Rice bran oil & excipients. Caution: Do not use on broken or irritated skin, check for allergies. Use & Benefits: This gentle scrub is fortified with cucumbers, sugar, & mint oil. It effectively removes dead skin while keeping the skin hydrated & yet oil-free. Application: Gently massage avoiding under eye area. Rinse well with lukewarm water. For best results use twice a week. Ingredients: Dried Cucumber Seeds, Neem Oil, Mint extracts, Lemon Oil, Turmeric, Shea Butter, DMDM Hydantion, Triethanolamine, Retonic acid (Vitamin A), L-ascorbic acid (Vitamin C), a- Tocopherol (Vitamin E) & Excipients. Use & Benefits: A natural turmeric facial scrub, which gently exfoliates dead skin cells. It contains anti-bacteria and anti-inflammatory agents to boost healthy skin and leaves skin clear, radiant, and smooth. 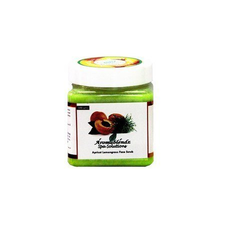 Application: Scoop out a handful of this skin softening scrub &massage gently over the skin for 5 to 10 minutes. Cleanse with warm water. Ingredients: Turmeric extract,Thanaka powder,Apricot kernels. Caution: Avoid use on any cuts or delicate areas. Do not exfoliate if skin is sunburned or irritated for any reason. Use & Benefits:This delectable Chocolate Facial Scrub polishes skin and infuses it with powerful antioxidants for a radiant glow.Regular application softens, exfoliates & tones your skin, reducing fine lines & wrinkles. Ingredients: Coco Powder, Citric Acid, Magnesium Sulfate, Lithothamnium Calcareum, Coconut Scrub Granules Avena Sativa Flour, Magnesium Oxide, Laminaria Digitata, Parfum & Excipients. Caution: For external application only. Do not ingest. 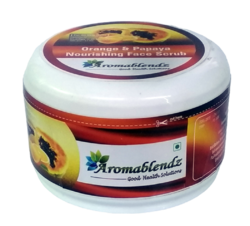 Use & Benefits: Aromablendz Orange & Papaya Body Scrub is a 100% natural, oil based exfoliator. It has a triple function. Sea salt crystals exfoliate dead skin cells, easing the top skin layer renewal. 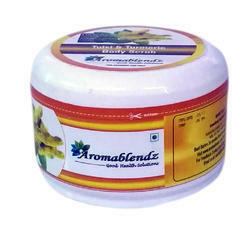 Vegetable oils and Shea Butter nourish and moisturize the skin. Tea Tree essential oil, being the most powerful natural antibacterial ingredient, cleans the skin deep in the pores.This product is safe for every kind of skin, and even for people with very sensitive skin. Application: Massage gently in circular motion & leave on the face for 5-10 minutes. Rinse thoroughly with warm water. Regular application nourishes & hydrates the skin, reducing spots & fine lines. Orange Oil & Vitamin E as main ingredients. Caution: Do not use on broken or irritated skin. Use & Benefits: Regular use reduces deep pigmentation marks & blemishes. 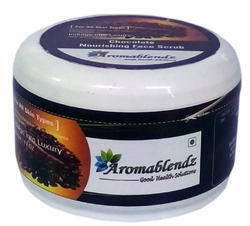 It is also a gentle exfoliator that leaves your skin feeling fresh, smooth & clear. Ingredients: Aqua, Almond Oil, Lavender Oil, Rosemary Oil, Stearic Acid, Cetyl Alcohol, Glyceryl Stearate, Walnut Shell Powder, Manjistha, Tocopherol (vitamin E), Retinyl Palmitate (vitamin A), Magnesium Aluminum Silicate, Titanium Dioxide, DMDM Hydantoin & Excipients. Caution: Avoid application on open wounds & cuts. Store in cool & dry place. Use & Benefits: Regular use leaves your skin soft & healthy with its strong exfoliating & moisturizing properties. 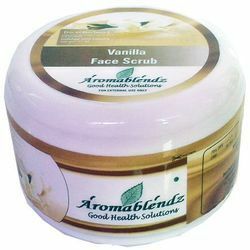 The product is a cocktail of vanilla & marshmallow an excellent combination for great skin. Application: Gently massage scrub all over face and down the neckline in circular motions. Rinse with warm water and pat dry. Ingredients: Aqua, Almond Oil, Vanilla, Marshmallow, Stearic Acid, Cetyl Alcohol, Glyceryl Stearate, Walnut Shell Powder, Manjistha, Tocopherol (vitamin E), Retinyl Palmitate (vitamin A), Magnesium Aluminum Silicate, Titanium Dioxide, DMDM Hydantoin & Excipients. Caution: Avoid application on open wounds & cuts. Store in cool & dry place. 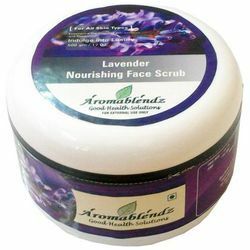 Looking for Aromablendz Face Scrubs ?